Space is fascinating, and so are the people who study it. That’s why we couldn’t wait to get our hands on Jennifer Berne’s Look Up With Me: Neil deGrasse Tyson: A Life among the Stars, just out last month. Disclaimer: The copy of this book was given to me free of charge. I chose to review this book because we love space and enjoyed reading all the previous Jennifer Berne books. I get commissions on qualified Amazon purchases made through my links. When familiar brightness of the day gives way to night’s velvety darkness, magic happens. Look up and see the moon, the stars, and the planets. Yes, even planets. Right now (March) you can easily see five planets—Venus, Mars, Saturn, Jupiter, and Mercury. When Neil deGrasse Tyson was a little boy, a planetarium visit ignited his curiosity about the things he could see when he looked up. His curiosity made him question (Where do comets come from? ), wonder (How big is outer space? ), and learn (he devoured books about the cosmos). His learning led to discoveries that made him even more curious and eager to go deeper. He got a job walking neighborhood dogs to earn money for a powerful telescope. He studied the night sky and read a great deal. The more he learned, the more his desire grew to share what he knew. At fifteen, Neil deGrasseTyson gave his first lecture on astronomy, and he is still lecturing today—talking about the mysteries of the universe and making science fun for those of us who are not astrophysicists. Look Up With Me is a great introduction to the life of a contemporary American scientist. I like that the book focuses on Neil deGrasse Tyson’s curiosity, and the effort he put into getting where he is now, rather than on his amazing achievements. Jennifer Berne writes with a light touch, offering kids just enough information to deliver an accurate portrait, but not so much as to overwhelm or bore young readers. I love the humorous details that bring the story alive. In one scene, Neil DeGrasse Tyson was looking at the stars through a telescope on his building’s roof, causing neighbors to call the police because it looked like he was wielding a dangerous weapon. He ended up teaching some astronomy to police officers who showed up to investigate. My two older kids were excited to learn that a childhood interest can lead to a career. This book definitely offers a springboard to a great many discussions, not only about the mysteries of the universe but also the value of hard work, determination, and retaining your curiosity for life. 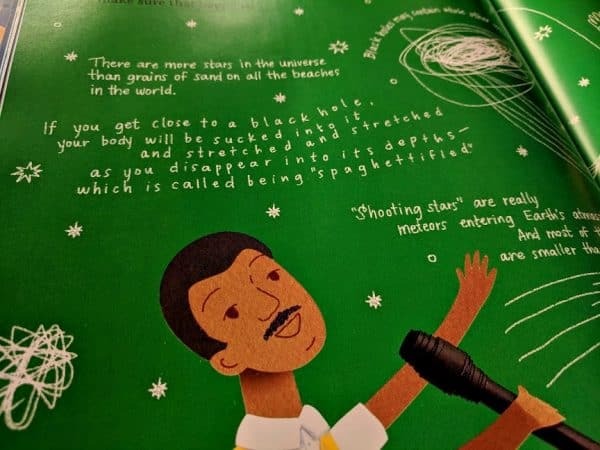 In the book’s introduction, Neil deGrasse Tyson writes that “scientists are kids who never lost their natural childhood curiosity about the world” and encourages kids to remain curious. Another of his recommendations, mentioned later in the book, is to have your mind blown at least once every day. I’ve written about how committed I am to exposing my kids to many diverse topics and experiences. And this book shows the value of this approach. For Neil DeGrasse Tyson, a random visit to a planetarium changed his life. We can never know what will inspire our kids’ passions and lead them to a fulfilling career path. All we can do as parents is expand their minds to new possibilities and show our kids opportunities they never thought off. I’ll be honest: I love all of Jennifer Berne’s books. She is a great researcher, a wonderful writer, and a nice person. In a note at the end of the book, she talks about her inspiration for writing Look Up With Me and how Neil DeGrasse Tyson encouraged her at the beginning of her book-writing career. If your kids are dreaming of becoming writers (like my kids! ), they might be very interested to learn about “forty rejection letters,” or a folder of rejection letters that are considered a necessary rite of passage for published writers. This book inspired me to finish Astrophysics for People in a Hurry, a book by Neil deGrasse Tyson that I downloaded on my phone a year ago. I didn’t finish it not because it’s not interesting but because there are always a great many books competing for my attention. Reading this book also inspired my family to “look up more” and we even downloaded some astronomy apps for stargazing. Lorraine Nam’s illustrations are fun and unique. When I learned that they are made up of photographed 3-dimensional paper sets I just had to learn more about it and emailed her some questions. You will be “blown away” to learn that in this medium “all the characters, the buildings, and the objects are made physically in paper. Then they are all put together like little dioramas and then photographed to create the final images in the book.” Even books on the bookshelves! You absolutely have to watch this youtube video with your children to get a more accurate idea of a creative process. If your kids see science as another task in school, share with them this book! Making illustrations for this book is science. “Because they are all physical objects, the making of each object requires a little bit of engineering, math, and planning.” If you are a parent or an educator you know that STEAM is a buzzword right now. STEAM is an acronym for an educational approach that focuses on the integration of Science, Technology, Engineering, Art, and Math. So, for a fun, hands-on STEAM activity challenge your kids to create paper illustrations for their favorite book. They will be learning while having a lot of fun! I was astonished to learn what a tremendous amount of research goes into illustrating a book. The job of a biography illustrator is not simply to bring life to writers’ words but to make sure that illustrations give an accurate idea of a person’s life. One of Lorraine Nam’s inspirations was Neil DeGrasse Tyson’s interview about the intersection of art and science in da Vinci’s work. Starry Night by Vincent van Gogh is featured in the book a few times and is Neil’s favorite work of art. Neil’s favorite physicist is Sir Isaac Newton who discovered the laws of gravitation. In the beginning of the book, Neil is testing the laws of gravity by dropping an apple on a Newton bust. In the spread when Neil is on the roof of his apartment building, he is dropped the cord of his telescope to his sister. In real life, his sister used to help him carry his telescope up to the roof. The actual name of the apartment building that Neil grew up in was called ‘Skyview’ which is shown on the same page. In real life, Neil loves his star themed vests so in the book, every patterned vest that Neil wears is different. In the front end page, it shows Neil cutting out paper stars which hints at him making the story of his life in the paper illustration medium. Currently, biographies about inspirational people written specifically for kids are a major trend in the publishing industry. We read a lot of them, and Look Up With Me is a welcome addition. How often do you gaze up in the night sky? Whether it’s once a week or never, Look Up With Me is a book that will inspire you to do it more frequently. What are your favorite books about stars, the solar system, and black holes to read with kids?